You can use any asset in your name to secure a loan against property. This type of loan is considered to be secured with collateral. Secured loans offer many advantages to both the lender and the borrower, but they do not come without challenges and risks. Before using your property to take a loan, weigh the merits of this structure against other loan options available to you. For a lender, a secured loan is a safe option. If for any reason the borrower cannot repay the debt, the lender has an asset of equal or greater value than the loan itself. The lender can seize and liquidate this asset in order to recover at least a portion of the cost of the loan. This is even true with a home equity loan. Although the home equity lender does not have a primary lien on the house, it can purchase the primary mortgage and foreclose on the home if needed. Whenever a lender has a property lien, the lender has added security. For a borrower, there is substantial risk putting an asset on the line in order to secure a loan. However, taking this risk does result in sizable benefits. First, it is often easier to secure a loan against property than to take an unsecured loan. Since the lender has insurance against default, it is willing to extend the loan to a borrower who may have slightly less than perfect credit. Further, the added protection for the lender often results in a lower interest rate. These two factors mean a borrower can almost always get a reasonable loan as long as he or she has a valuable asset to put on the line. The most prevalent example of a loan against property is a car loan. This loan is highly popular because of the way it uses an asset as collateral on the loan used to purchase that asset. If the borrower defaults, he or she loses only the car, which wasn't an asset to begin with. 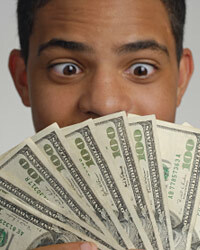 The loan is popular for lenders because many dealers actually have a financing arm. They can finance the purchase of their own vehicles, making money on both the sale and the loan needed for the sale. Other examples include mortgages, home equity loans, computer loans, stock loans and savings account loans. When you have a large asset, like a car, home or business, you may find a lot of lenders knocking at your door. These lenders know a person with a credit score high enough to secure a large debt is responsible, likely has a high income and, as a result, is a good prospective borrower. You may find you are pre-approved for a home equity loan the day you purchase your home. However, just because a lender says you can afford a loan does not mean you truly can. With a secured loan, the lender takes very little risk. It may be willing to extend a debt you have a high likelihood of defaulting on. Always budget and never collateralize property without prudence. How to Borrow against Life InsuranceInvesting 101: Profit-TakingDebt Consolidation Loan or Borrow against Your Life Insurance Policy?What Forms of Property Risk Do You Need to Insure Against?